● Shop the Sale & Clearance page for discounts as high as 75% off on dozens of selected products. ● Join the Inside Track Club for $29.99 annually and get access to special benefits including weekly emails with member-only savings, early access to parking lot sales and first dibs at Deals of the Month. ● Coupons for a 20% discount off any one item are always available; valid online or in-stores. Other codes typically offer discounts as high as 50-70% off specific products. You can also visit the Harbor Freight Coupons Section for the latest deals. ● Check out the Monthly Ad for great deals on featured products as high as 80% off regular prices. You can also sign up for the company’s email newsletter to get regular updates on new coupon codes and catalogs. ● Harbor Freight offers a flat-rate shipping fee of $6.99 anywhere in the contiguous US, excluding extra charges for overweight and oversize items. 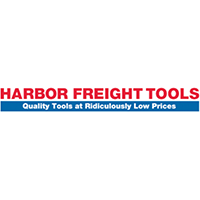 Harbor Freight Tools is an online store that carries many different industrial tools that you can either use on the job or at your home. They offer power tools, air tools, hand tools, tool storage, automotive and motorcycle components, engines, generators, welding equipment, lawn and garden products, material handling items, and so much more. On the front page of their website they have links to take you to many ways to save such as the sale and clearance section. You can also browse through their inventory by interest, so if you don't know what you're looking for, the site will generate a list of recommended materials based on what you're interested in accomplishing. For most up to date offers check out Harbor Freight Tools on Facebook and Twitter or contact Harbor Freight Tools Support for any questions.